Check out this interesting article about Pittsburghese from Slate! 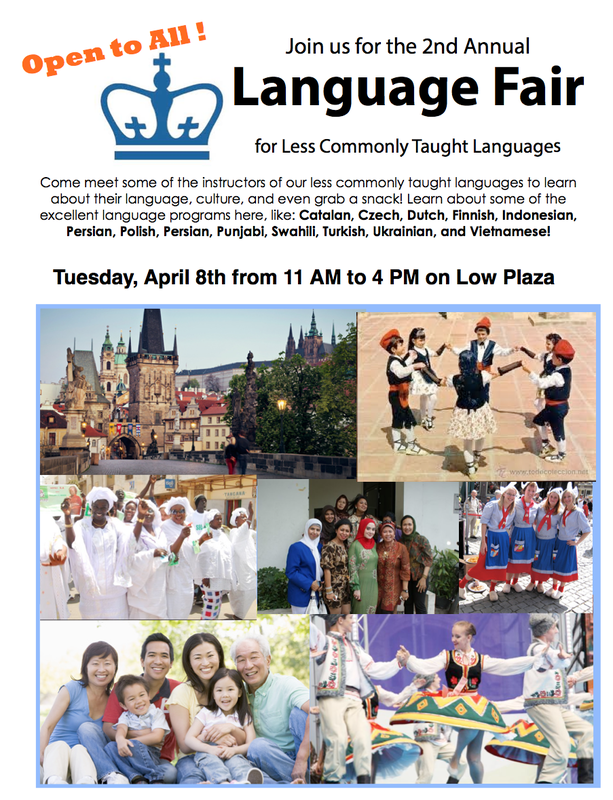 Here’s an event that you most definitely would want to check out: The Language Resource Center, in cooperation with the Sole Language Instructor’s Club, is organizing the Less Commonly Taught Language Fair, featuring Persian, Dutch, Finnish, Vietnamese, Czech, Swahili, Ukrainian, Wolof and Catalan. Come to Low Steps anytime between 11am to 4pm to hang out with instructors and learn about these language offerings at Columbia! Join us for the inaugural event of AGORA: Language and Literary Traditions in Conversation– a new series exploring the beauty of language and culture. 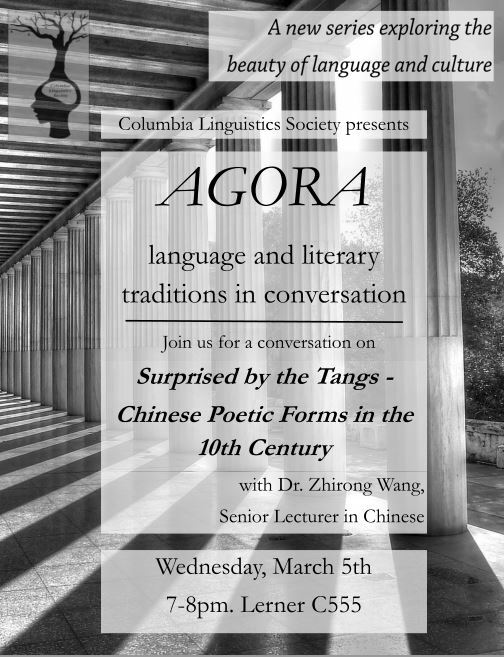 Professor Zhirong Wang will be guiding a conversation on Surprising the Tangs: Chinese Poetic Forms in the 10th Century. You can find the Facebook event here. Hope to see you there! If not, please keep an eye out for our future events and join our Facebook group at https://www.facebook.com/groups/2291153471/. 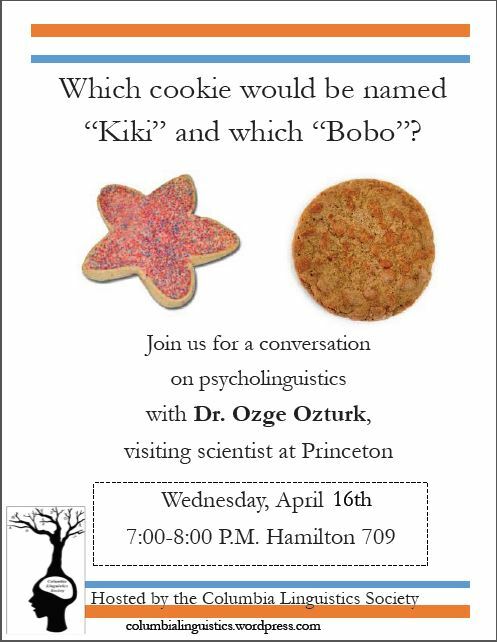 Co-Hosted by The Columbia Linguistics Society and The Workshop on Meaning: Language and Socio-cultural Processes. The word ‘Spanglish’, used most often to describe the casual oral registers of the speech of Hispanics in the USA, is an unfortunate and misleading term. Speakers of popular varieties of Spanish in the USA would be better served by recognizing that they are already speakers of Spanish. The present article is intended as a technical discussion of the empirical foundations for our position that there is no justification for the use of the term Spanglish. We demonstrate that features that characterize popular varieties of Spanish in the USA are, for the most part, parallel to those of popular forms of the language in Latin America and Spain. Further, we show that Spanish in the USA is not of a hybrid character, that is, not centrally characterized by structural mixing with English. We reject the use of the term Spanglish because there is no objective justification for the term, and because it expresses an ideology of exceptionalism and scorn that actually deprives the North American Latino community of a major resource in this globalized world: mastery of a world language. Thus on strictly objective technical grounds, as well as for reasons of personal and political development, the term Spanglish is to be discarded and replaced by the term Spanish or, if greater specificity is required, Spanish in the United States. Monday, November 19th, CLS is hosting a potluck at 8PM in East Campus 820! 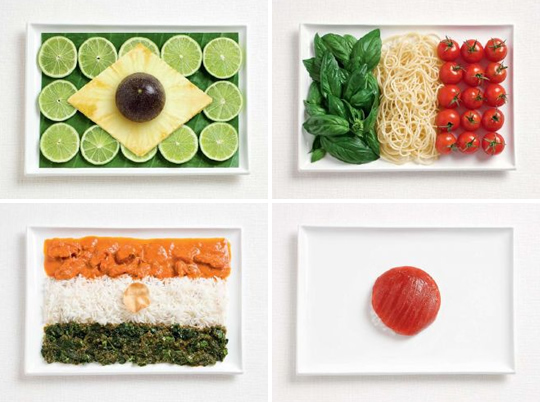 Bring your favorite food from the country of your favorite language (or just something you like to eat!) and come hear about summer opportunities in linguistics, linguistics related internships, and the linguistics major at Columbia. RSVP to jnb2122@columbia.edu, and please note if you are not a Columbia student, because you will have to be signed in. I wish I were an anaphor so I could be bound in your domain. Society of Linguistic Undergraduate Students (SLUGS), University of Toronto.